The entrance and exit at the Coffin Butte Landfill last week. Republic Services has revised downward its intended price increase for dumping small loads at the Coffin Butte Landfill. Instead of $85.75, the minimum fee starting Jan. 1 will be $40. That’s according to an email from Julie Jackson, the municipal manager for the Corvallis-based operations of Republic Services. 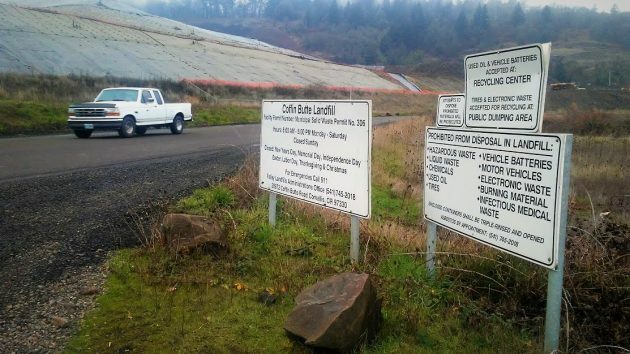 Previously, according to signs at Coffin Butte and a report published in the combined Albany/Corvallis daily on Dec. 8, the company intended to raise the minimum dumping fee from $28.75 for up to 500 pounds to $85.75 for up to 2,000 pounds, an even ton. The company said one reason was to discourage people from going to the dump. It said it was doing so to increase safety and reduce congestion. So, the left hand and the right foot didn’t communicate. Blame it on the minimally-instructed intern doing what he/she thought was right. Some lower level employee was likely responsible for the signing. Somebody farther up the food chain is accountable. Wait a minute. If you live in Benton Co. Republic will pickup a mattress for $35.16, but the cost in other areas is unknown? Does this mean that someone living in Albany (Linn Co.) might pay more or less than if they lived in Albany (Benton Co.)? This whole thing is still unclear and Republic needs to get down to business and publish a rate, not by county but by each franchise area. Way back when you’d go out SW 53rd Ave (off of Pacific Blvd) to the dump and an adventure it was ! You could “plunder” in other people’s junk. Yes…At the entry a group of one or two “monitors” made a quick look over your load to collect a fee & make a quick look for booty/metals. Then you went in to navigate around the loads to dump your load off by hand. Thus you had an opportunity to look over all the other trash coming in. We won’t mention what Wah Chang used to dump out there. No wonder the sparkling gases seen now & then now ???!!! And glowing foot prints….!!!! Even at Coffin Butte before “modernization” you had a chance to jump in & plunder when they’d just dump over a ledge. I’d take in a little in & come back with more! Those current deep dump trailers really make it difficult to “search’. NO recycling going on there any more! As it’s said: “One mans trash is another mans treasure”. A run to the dump was a real happening in the ‘ole dayz. Still, many thanks for the Spring clean up that is hosted by Republic Services. [ the price jump, was to discourage people from using the dump]? How idiotic is that? And the wisdom behind that, is so that people will pay for Street collection. It should be FREE to ENCOURAGE people to use the dump. But see, it’s more about money than it is about keeping our land clean. As an aspiring skeptic, I think I agree. It seems really hard to believe the announcement of the original price hike was a complete accident. It also seems like if you run a trash company and want to discourage the general public from using your dump, you create non-dump options that are so attractive as to be a no-brainer. For the 22 years (1990-2012) that I lived within a few miles of Coffin Butte, I hauled our household trash to the dump, maybe 3-4 times a year. It was cheaper and easier than dragging cans a couple hundred yards out to our road. In 1990, btw, it cost $4 to dump a pickup load. Seems like the price went into the $20s maybe 15 years ago. The whole garbage hauling/dumping process never felt dangerous or otherwise negative, though I will say that on my last trip to the landfill a year and a half ago the traffic was noticeably heavier than had been the norm.